In Brief: (scroll down for more detail). * The absolute CLOSEST vacation rental area to Disney. * Brand new luxury remodelling completed in 2015 including new bathrooms, carpets, spanish floor tiling, furniture and bedding. * 2 Brand new luxury master suites featuring queen sized beds, "posturepedic" pillow top mattresses, 320 count white cotton sheets and comforters, widescreen HDTV's and DVD players and Ipod/MP3 docking systems. 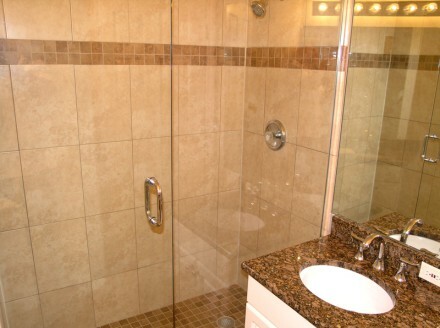 * Brand new master bathroom!. Custom designed, with an oversized 'rainforest' shower, double floating vanity and oval tub with natural stone tiling throughout. 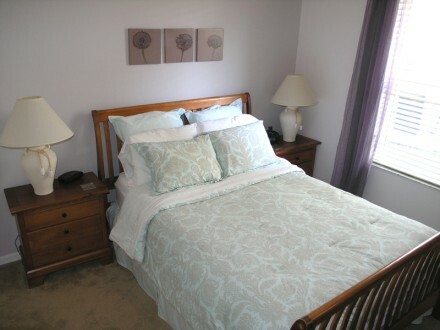 * 2 newly remodelled twin rooms, both with private access to a newly remodelled bathroom and brand new furniture and bedding. * En suite bathroom access from every bedroom. 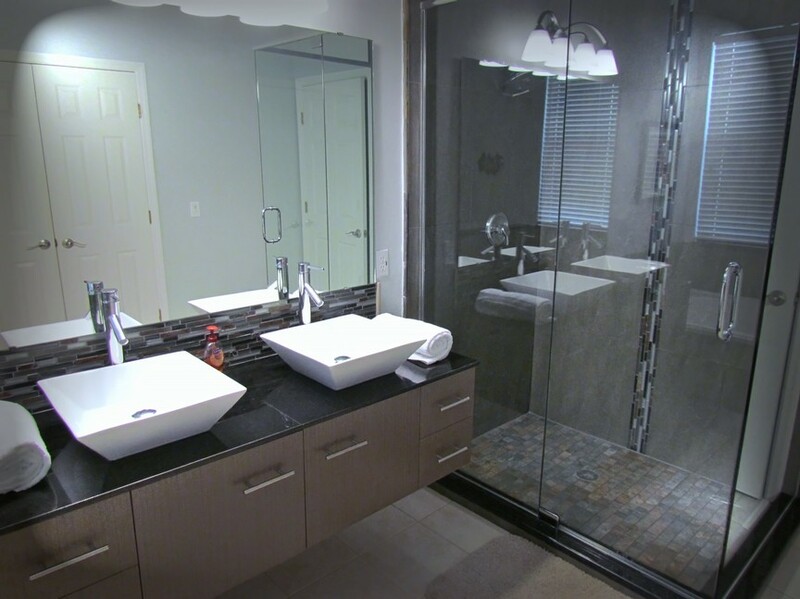 All bathrooms have oversized glass framed multi-setting massaging showers, granite counters and natural tiling. 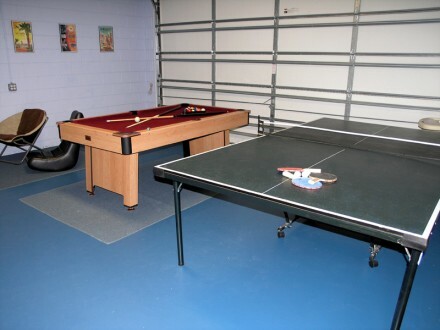 * Brand new games room with pool and table tennis tables. * FREE use of brand new four burner gas BBQ/grill. * FREE use of brand new high chair, stroller and crib. * FREE unlimited local, national and international Telephone calls. * PS3 / Blu-ray player in the living room. * HD DVD players in both master suites. * PS2 with selection of games, 5 CD players. * Our rates include ALL taxes and fees. * Visit our guestbook on the link below for reviews from recent guests. 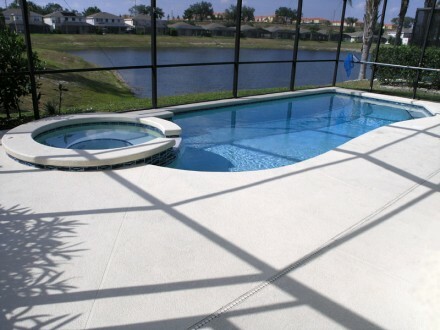 Sunset Lakes is a small gated community located in Orlando's most desirable Vacation rental area. 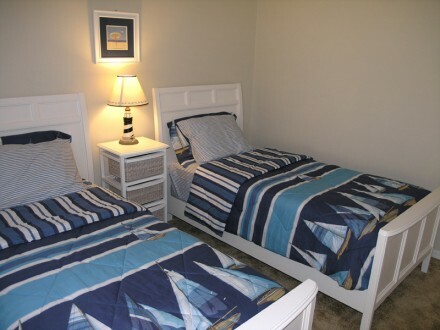 In addition to the property's quiet lakefront location the community has a large swimming pool childrens play area, and a fantastic selection of local wildlife. 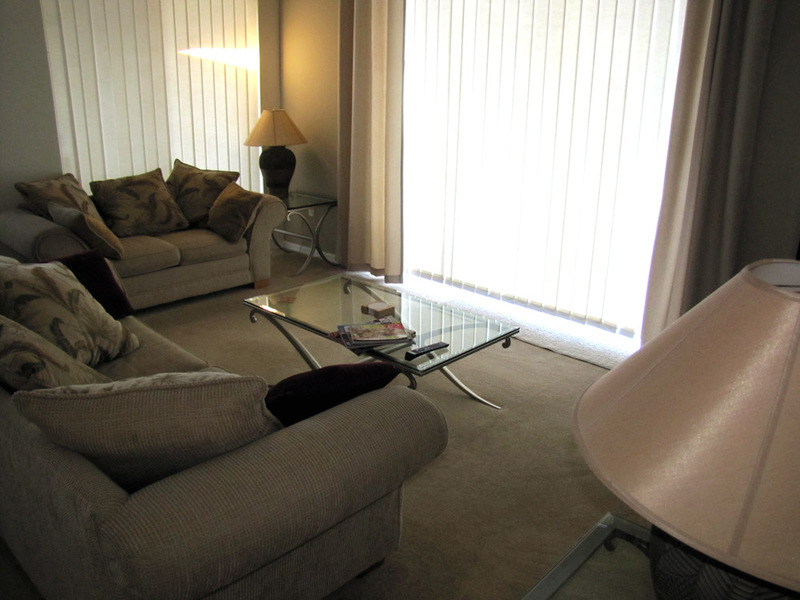 Our home is just 3 miles from the Disney parks and just one mile from many quality Restaurants, supermarkets and shops. Sunset Lakes one of just a handful of communities that are close enough to Disney to allow you to leave the parks and return again later-something that many hotels cannot match! The property backs onto a large lake, overlooked by your private 28 foot pool and 6 person spa/jacuzzi tub. From here you can watch the hot air balloons glide over Animal Kingdom or even watch the fireworks at Magic Kingdom. The house features a large open plan living area with a seperate dining room and a newly remodelled lounge/family room offering brand new furniture and a state of the art entertainment centre with a brand new 37' HDTV with full cable (some channels in HD), PS3 / Blu-Ray player and stereo system. The kitchen is equipped with all amenities and appliances including a large fridge/freezer with that all important ice machine!. We even provide a blender for any budding cocktail mixologists!. The kitchen also features a raised breakfast bar complete with bar stools. There are two master bedrooms. 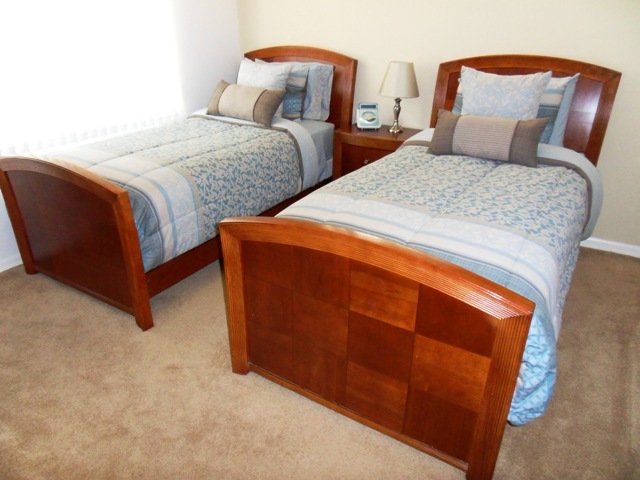 Both have been luxuriously upgraded with new furniture and feature top grade pillow top mattresses and premium bedding. the first master has direct personal access to the pool deck via sliding doors and offers a large wallk in closet. 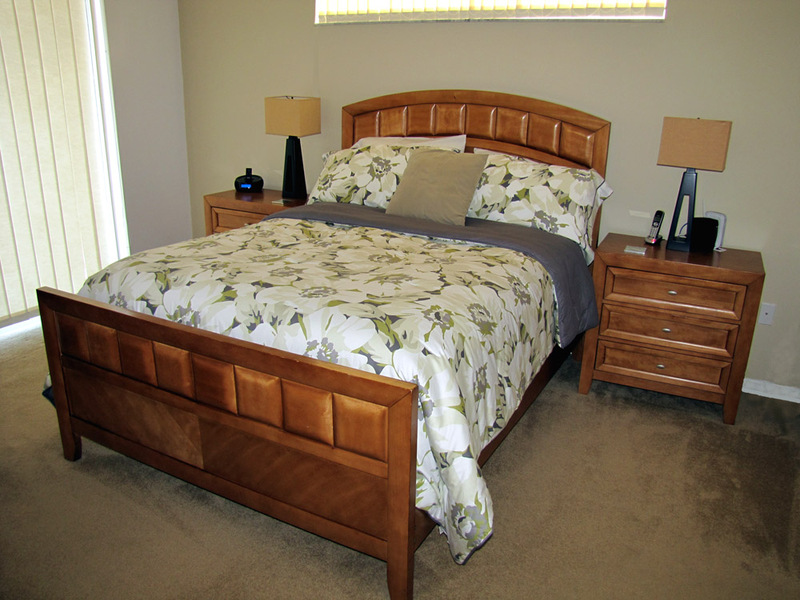 Both master bedrooms offer direct access to private master bathrooms with his and hers sinks. 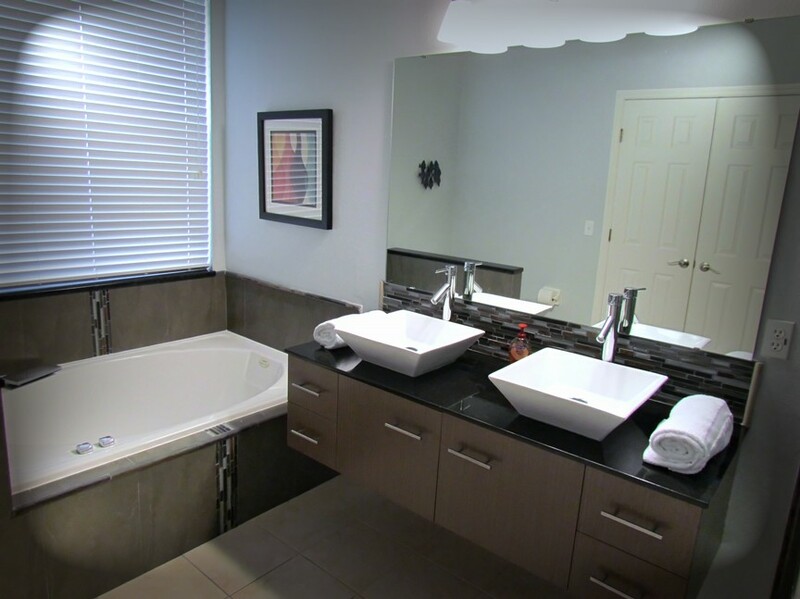 The first master bathroom has a large oval tub and huge separate walk in shower. 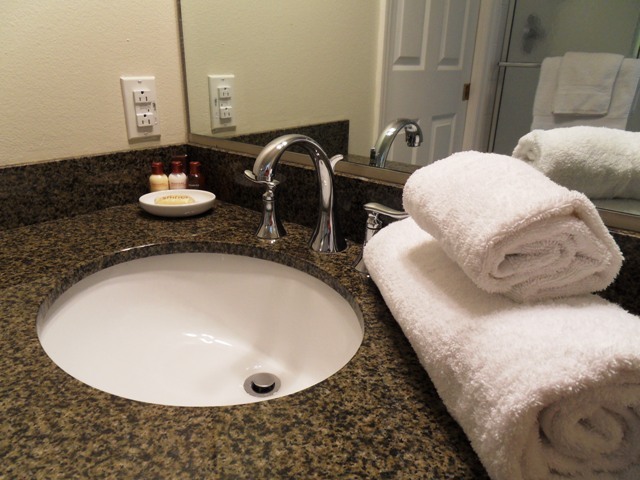 The second also offers full bath and shower facilities and both have brand new 23' Samsung HDTV's and DVD players. You will also appreciate luxury touches usually reserved for upscale hotels such as oversized multi-setting massaging showers and Ipod/MP3 docking systems in both rooms. For al fresco dining we have just added a large table under the covered and lit Lanai. A large brand new gas grill (BBQ)is provided free of charge. There is ample seating for a large family as well as a selection of recliners and sunbeds for lazy days by the pool. This property is the current holder of best garden in Sunset Lakes! Features a pool table, full size table tennis table, board games and a seating area featuring a leather sofa with a playstation2/DVD console set up to a large flatscreen TV. This property is graded as Executive/luxury standard, meaning that it offers facilities and furnishings consistent with those found at a luxury hotel. There are many similar sized properties in the Orlando/Kissimmee area but only a handful achieve this grading. We stayed at your lovely home for two weeks. The first week was just my wife and myself, and the location was perfect for seeing the space center, and other attractions. The second week our son and his family came down and went to Disney, and particularly enjoyed the pool, as attested to by our water-wrinkled 6 year old grandson. 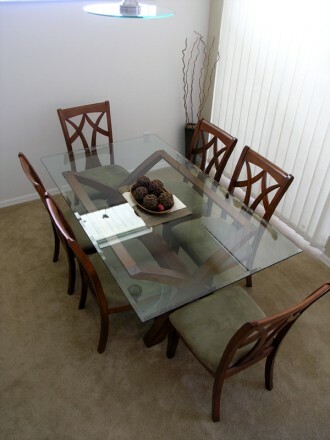 Having rented many places in the past we were extremely pleased with the comfortable furnishings, the spaciousness, quality and condition of the furniture, and the decorating which reflected your good taste and trust in your tenants. The information you supplied before our arrival was very helpful in so many ways. Thank you so much for making it available to us. Sunset Lakes is a well-maintained community set around 2 well stocked fishing lakes and conservation areas. The larger lake provides a small fishing pier and cabana, from which to enjoy romantic sunsets and view the Disney Fireworks. There are communal facilities available for all guests, comprising of a large swimming pool with changing facilities and sunloungers plus a play area for the youngsters.The beauty of Sunset Lakes is it's peaceful and rural location, yet so close to all the amenities and attractions. The shops and restaurants of H/W 192 are only minutes away by car or an approx 30-minute walk. Disney World can be reached within 10 minutes and The Universal Parks/Sea World is a 20-minute drive and there are numerous Golf Courses close by for the golf enthusiasts. With the newly opened Champions Gate Course only a short drive away. A little further a field are the beaches – the Atlantic Coast and Kennedy Space Centre are 1 hours drive and the nearest beach resort on the Gulf Coast of Clearwater will take you 1 1/2 hours to drive. Busch Gardens at Tampa is a little nearer and usually takes 1 hour to reach. Orlando4Villas opinion,Sunset Lakes Kissimmee offers much for the family coming on vacation to the Orlando / Kissimmee area. The community Sunset Lakes is a fantastic resort, great for familys and provides everything you need to have a perfect stay in the Disney area, with shops, attractions, large shopping malls, resturants and night life in the area there is nothing more to ask for in a perfect location. 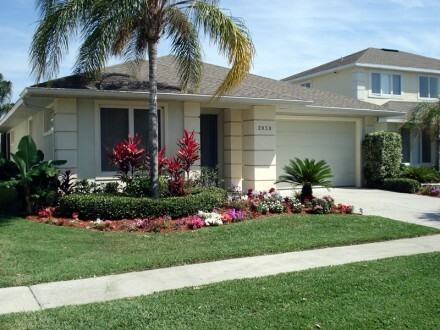 Orlando4Villas has the large selection of vacataion homes available for rent in Sunset Lakes.